Averill’s Sharper Uniforms is really getting around these days! 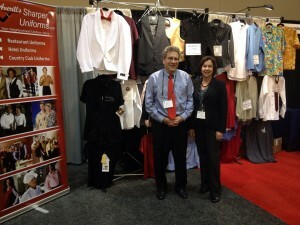 We spent some time at the 2012 Club Business Expo in New Orleans, LA on February 26th and 27th. We were fortunate enough to meet some great people, make some great connections, and get in touch with those that could benefit from our line of uniforms. The Club Business Expo is the largest industry event of its kind, bringing general managers, CEOs, and COOs from some of the best and most prestigious clubs around the world. Here at Sharper Uniforms, we have the right outfit for many different kinds of businesses, and that’s why we were so happy to spend some time with all of these great people. We met management teams from yacht clubs, athletic clubs, golf facilities, and so much more. We were proud to offer information about our polo shirts, spa uniforms, and other quality business club products. To top it all off, everyone that visited the Averill’s Sharper Uniforms booth got a free Crumber! If you didn’t make it to the expo, don’t worry! We’ll be at the New England Food show from March 11th to March 13th. Come visit us at Booth #2913. We’ll have free gifts at the booth and a drawing for a surprise gift at the end of the show!